Step Back To A More Artistic Time, And Add Some Class To Your ‘Joint’! Looks fantastic in a Manhattan apartment, retro restaurant, bar or club! Our new exclusive design met with ooh’s and aah’s from everyone with whom we shared our preliminary designs. Now the Art Deco Diner Booth is moving into first place, and is now one of our most requested booths – everybody wants it! The complete set is comprised of two 44” benches upholstered in Burgundy (Red) ZODIAC with Silver ZODIAC Insert “V” and Piping. Also shown, with this featured set is our Art Deco custom cut table laminated in Red Glacier Boomerang with 1.25” metal banding. A unique combination, sure to become a best seller. We love it, and hope you do too! Be sure to ask about all the options available on this model, especially the hidden hinged storage feature. If you like this model, we also offer Art Deco Diner Booth in a quarter circle, a half-circle, or an “L” Shape configuration with complementing table and base. Please call 304-728-0547 and ask to speak with one of our booth specialists. Let us offer our expertise in assisting you to create a set that is perfect for you! 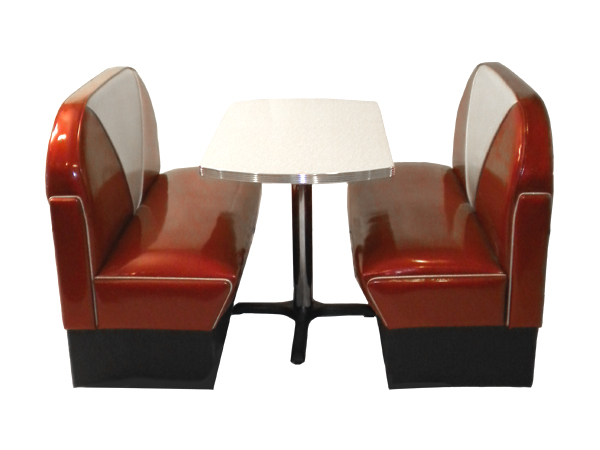 The Art Deco Diner Booth Set – $1750! Add a Hinged Seat and Storage Compartment to this Booth! This feature is perfect for booths in restaurants or homes that need extra storage. You’ll love the convenience and storage and your guests won’t even know it’s there! Priced in standard vinyls and laminates at $1,750. Questions? Send us an email and one of our retro specialist will respond right away. We offer a great commercial customer discount when ordering in large quantities. Let us help you build your diner or retro restaurant.